The bread is alive! If I put it on the floor, will it run away? If it’s alive it may? Okay, Jesus didn’t mean that. So, what are we talking about? Jesus iis inviting us to eat the bread. The meal Jesus invites us too is a remembering and a doing of the Passover meal he shared with his disciples. Jesus was the biggest giver ever! He gave his time his love, his energy, his heart – all he had. At the meal, he was going to give his biggest gift ever. Give, give, give – the giving that started at the meal, and ended when he gave his life on the Cross. From here (table of the Eucharist) to here (Cross) was about a twelve-hour journey of giving. And Jesus wants us to do the same! His giving and sharing, and loving, and all that stuff, took a lot of energy – heaps. To do what Jesus did, we need that energy as well. That’s why we have the bread of life. It’s not the bread that runs away. When we have the bread, we run to God with Jesus, because we have his energy and life within us. When we have this bread, we can give, give, give. 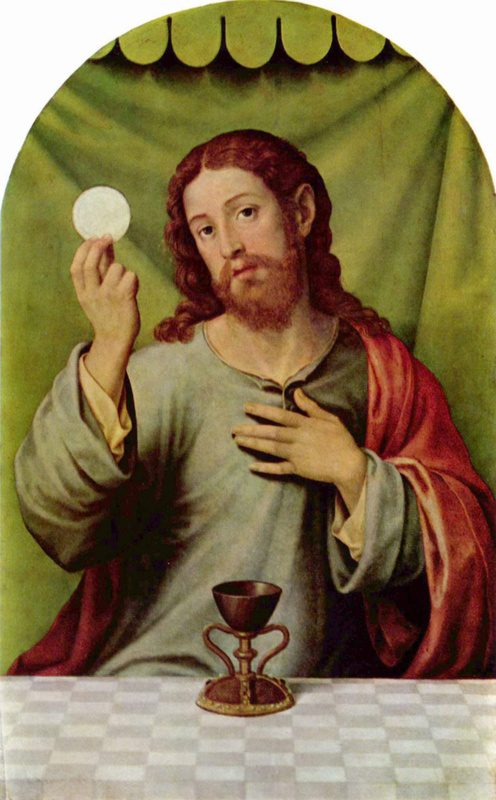 When Jesus offers his Body and Blood during Mass, we are given the opportunity to be a part of that his offering of himself to God – and then to receive communion to have the strength to do it. It is not ordinary bread. It is Jesus Body. And the wine becomes his Blood. This is a special belief of the Catholic Church and the Orthodox Church. It gives us real energy because it nourishes us with Jesus himself. But to be in this race—to run with Jesus—we need to start at the beginning. We need to belong to God and to the Church. The Church does all this stuff with Jesus, so let’s belong to the Church first. Baptism is the way we do that. When you are baptised, you receive God’s Spirit and you become a son/daughter of God and you belong to the Church. Any bad stuff gets forgiven, and we all become one big family. Are you ready to belong to God and to God’s family, the Church? Let’s go to the font!